Beginnings are always exciting, the beginning of college especially so. The transition from what seems to be a boring, monotonous school life to what we expect to be an exciting college life is one every twelfth grader looks forward to. College life is associated with a sense of independence and freedom that school life doesn’t offer. 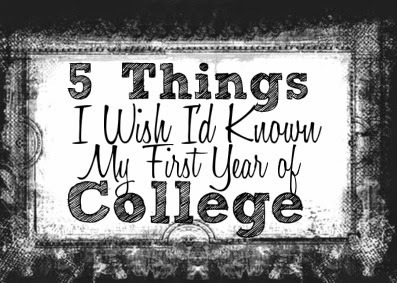 All freshers have a list of expectations, an idea of what their life will be like as a college student. College life is often considered a party life. It is a new beginning, a chance to get away from the image of being a school kid, and beginning life as an adult. In the midst of all the excitement about starting something new, however, there are certain things we should keep in mind. One mistake I made was being shy. The people in my class had no idea I was an introvert, and I had no courage to approach them. I let myself be friends with people who were easily accessible, rather than girls I felt were more like me. I also refrained from participating in any extracurricular activities or joining societies. I chose to focus on my major instead, even though college is supposed to be the time you explore all your interests. I feel like I’ve wasted a year of fun. She advises fellow introverts to step out of their comfort zone and attempt to increase socialising and other activities during their college years. I made the mistake of being too career oriented rather than enjoying my first year to the fullest, like a normal 18 year old kid. Now that I have a realistic perspective on life, I realize I spent my entire first year trying to do things to build my CV rather than settling down and enjoying college life. The first year is over, the blow has been felt and I now intend to spend the rest of my college years doing more of the things I want while keeping a healthy balance on my future plans. His opinion is contrary to that of Esha Gupta’s, as he believes he joined too many societies in an attempt to strengthen his CV and ended up having to deal with a great amount of work load that hampered his social life. All freshers should note that while societies are a great amount of fun, the work they require can equal it; so don’t bite off more than you can chew! Finding the right balance is the key. I was a little high headed during the initial days, mainly because I was a “dipsite”. I was judgmental about people, because of which I had problems working on group tasks. I guess everybody has an impression about college life, which is quite different from reality. We should walk to college with an open mind, if I had done that, probably could have made more friends and realise that good schools do not mean good people and vice versa. Claims Anushree Bhattacharjee, student at MBS School of Architecture and Planning. Truer words could not have been said! Another thing to remember is that the board results no longer matter either, once you’re in the same college, you’re equal. I think my main mistake was to not take teachers or studies too seriously. I know college education is a lot more relaxed, but I think I took it a bit too far and paid no attention to studies, never bothered to attend class. I ended up having to pull many all-nighters before my exams to ensure I clear my first year. I almost didn’t make it. Shares Bhavaya Chawla, student at Maharashtra Institute of Technology. He advises freshers to take out time between what he calls “chilling sessions” to flip through their books once in a while. Trusting people very easily is a wrong thing. When we come to college, in order to begin our new lives we make new friends, but sometimes we don’t really judge the person well. People pretend to be very different from what they really are, so initially we should be a bit careful about whom we choose to confide in. Of course, as mentioned earlier, it is impossible to avoid all mistakes in life. Therefore, the best thing to do is to walk into your college every day with a big smile plastered on your face, ready to face the various challenges and new experiences you will have to deal with as a fresher in college! Accepting and learning from one’s mistakes is something every person mentioned in this article has learnt to do, so freshers are best advised to follow suit! About author : Vaishnavee Sharma is a 2nd year B.A (Hons.) student at Jesus & Mary College, New Delhi.